Despite Natural History being about human evolution and transcendental insights, Robson refuses to employ the apolitical sense of the sublime that characterizes many SF novels with similar topics. This novel is no glorified evolutionary fable. Even when it addresses the idea of reaching a whole new level of existence, it remains embedded in the social and political landscape of human affairs. Or, to put it in the thoughts of the character Zephyr Duquesne: “Without a religious foundation, she wasn’t bothered by any questions of an insult to God or the hubris of Prometheus that might have arisen. But she was bothered by the strong feelings of many of the Forged that attached to, in her view, legitimate complaints about their situation.” This statement, which is more radical than it might seem at first glance, permeates the whole novel and makes it a true challenge to the conventions of “evolutionary” Science Fiction. Other reviews: M John Harrison in The Guardian, Tony Keen at Strange Horizons, Martin Lewis at SF Site. I’m surprised (as I have been by several elements of this poll) because this is my least favourite of Robson’s work – although this is only a relative valuing because I do really like her stuff. In some ways, much as I like the Lila Black books, I would like her to go back to the near-future settings of her first two books and do something new with that. But I shalll definitely have to read Natural History again. I would like her to go back to the near-future settings of her first two books and do something new with that. But I shalll definitely have to read Natural History again. 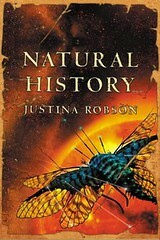 I quite like the Quantum History books, but I loved her first two, and Natural History seems to me like her peak so far.